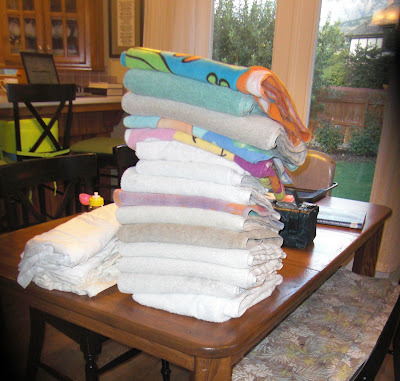 This is one nights worth of towels before I helped Brent understand the virtues of a mixing bowl when the stomach flu rears its nasty head. Unfortunately, Callista, Ellery and Brent shared a nasty but quick bout. One after the other. Needless to say, I haven't slept much this week! Oh we were soo in the same boat this week but I got it too....ugh. Hope everyone is feeling better! Oh Rebecca!!! :( That was some nasty stuff. All three of us got it on Tuesday at least it was a 24 hour thing. I never want to be sick and have to take care of a sick baby again. I'm glad your family is all better. That stinks, I sure hope everyone get's well soon! Jo Lynn, Invite me to your blog! I would love to keep up on how you guys are doing! I had no idea Ellery and Brent had also been sick! That's rotten. Hope you've caught up a bit on your sleep!